Today is flag day, and I hope we all reflect what the flag stands for as we continue to push towards securing our liberties once again. Thought I would go ahead and post some flag facts today, just something kind of fun and interesting, and breaking up the normal political debating and frustration we all feel here. – President William Taft issued an executive order in 1918 dictating the proportions for the flag and placement of the stars. Before then, these features were left up to the flag maker, resulting in unusual star arrangements and odd proportions. -Jan. 2, 1776 The first unofficial national flag, called the Grand Union or Continental Colours, was raised at the behest of Gen. George Washington near his headquarters outside Boston, Mass. The flag had 13 alternating red and white horizontal stripes and the British Union Flag (a predecessor of the Union Jack) in the upper left corner. -The name “Old Glory” was given to a large, 10-by-17-foot flag. flag owned by William Driver, a sea captain from Massachusetts. Driver’s flag is said to have survived attempts to deface it during the Civil War. Driver was able to fly the flag over the Tennessee state house once the war ended. The flag was last displayed in an exhibit in 2006. -Today the flag consists of 13 horizontal stripes, seven red alternating with six white. The stripes represent the original 13 colonies, the stars represent the 50 states of the Union. The colors of the flag are symbolic as well, red symbolizes hardiness and valor, white symbolizes purity and innocence and blue represents vigilance, perseverance and justice. -In 1963, Barry Bishop placed the flag on top of Mount Everest. – Betsy Ross, often credited with sewing the nation’s first flag, apprenticed not as a seamstress but as an upholsterer, learning to make and repair curtains, bedcovers, tablecloths, rugs, umbrellas and Venetian blinds. 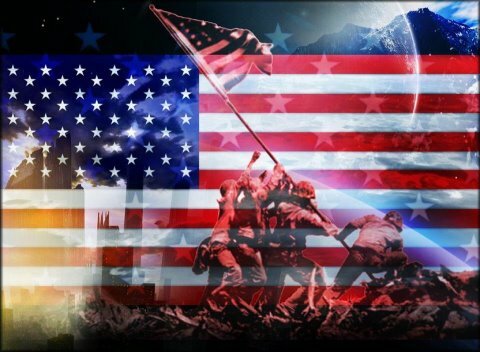 – Congress officially adopted the Stars and Stripes as the nation’s flag on June 14, 1777. The next day, Ross married her second husband, Joseph Ashburn. Her first husband, John Ross, had died during the Revolutionary War, as did Ashburn a few years later. Her third marriage, to John Claypoole, lasted 34 years. – The national anthem, “The Star-Spangled Banner,” is based on a 15-star, 15-stripe flag sewn by Mary Pickersgill for Fort McHenry in Baltimore. Vermont and Kentucky had recently been added to the original 13 states. – The U.S. flag has been modified 26 times since its adoption in 1777. Today’s 50-star flag, created in 1960, has been in use the longest. -In July 1969 the American flag was “flown” in space when Neil Armstrong placed it on the moon. -The first time the American flag was flown overseas on a foreign fort was in Libya, over Fort Derne, on the shores of Tripoli in 1805. Placed by United States Marines!